What’s the difference between circular runout and total runout? 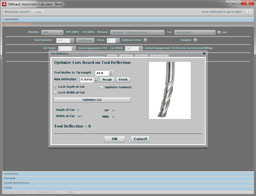 Total Runout controls the entire surface while Runout only controls certain circular cross sections. In other words, the Tolerance Zone for Total Runout is a 3-Dimensional cylinder with center hole surrounding the referenced surace, but the Tolerance Zonee for Circular Runout is just one circle, so it controls the axis and surface at one point. Because of this, Total Runout controls both surface irregularities and axial variations. It is commonly used for parts that rotate around a central axis whose entire surface must be in spec for proper functioning. Cicular Runout is most commonly used to control circular features on parts. Circular Runout requires a datum, so be sure to include the datum on your callout. In the example, the Datum is actually the face of the shaft, so that’s where you’d measure it with the dial indicator. Measurement of Circular Runout is a typical process for cylinder work. Put the part in a set of V-Blocks so it can be rotated around the axis them measure the total movement of a dial indicator held at constant height at the location of the circle definining the tolerance zone.